Finally, a heavy duty M14 EBR and affordability can now be used in the same sentence thanks to Classic Army’s M14 EBR Scout AEG. This electric rifle boasts a CNC metal body, retractable stock and adjustable cheek rest, not to mention enough rail space to mount an array of accessories and optics. 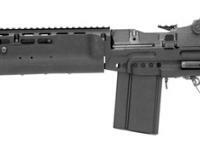 The M14 EBR Scout utilizes a metallic hop-up chamber and Classic Army’s signature high-performance motor. With the shorter, “Scout-length” outer barrel and the retractable stock, the M14 EBR Scout has the versatility of being suitable in both the CQB/MOUT and outdoor field environments. The gearbox is made of a sturdy metal and accepts many aftermarket parts, ideal for offering the option of heavily upgrading your rifle to suit your needs. *RPM is an estimate of the maximum rate of fire using a 12V NiMH battery on an unmodified AEG. Rate of Fire is dependent on a number of factors and will vary, primarily based on the user’s battery voltage.